So why does this phenomenon happen? Researchers say they suspect societal expectations about the roles each person plays in a marriage could be a main factor. “When married couples . . . violate the norm that husbands outearn their wives, the survey respondents reporting the couples’ earnings appear to minimize the violation by inflating the earnings of the lower-earning husbands and deflating the earnings of the higher-earning wives,” researchers wrote in their findings. If the misreporting is due to gender norms, might we expect this to go away as more women earn more money? Already, “In about one out of four couples surveyed, wives made more money than their husbands.” Give this a few decades and this misreporting might disappear. On the other hand, social norms can be last a long time even after society has changed quite a bit from when the social norm arose. If the misreporting continues or even increases, it would be interesting to see how the Census and other surveyors adjust their figures. “When you look nationwide at the share of households that had roommates or lived with parents, it did start to increase in the years just before the housing bust,” said Aaron Terrazas, senior economist with Zillow. “But it really took off during the financial crisis” that began in 2007, often referred to as the Great Recession. Since 2005, the doubling up has increased at the same rate among employed and unemployed adults, regardless of age, Zillow found. The share of 20-somethings living in doubled-up households climbed faster than any other age bracket, but people in their 50s came in second. The median individual income of an employed adult in a doubled-up household is $30,000, compared with the $45,000 earned by those living alone. I suspect more Americans would want to live alone – for reasons that sociologist Eric Klinenberg describes in Going Solo – but resources can hold them back. I wonder if the same trend is present on college campuses: those students with more resources live in solo rooms or can live in nicer settings off campus while others may not be able to access those residences. More broadly, this gets at what Americans think about privacy and intimacy, personal space, and what home should be like. Are roommates really only an option until you find something better (a family or relationship of your own choosing, living by yourself because you can afford it)? Does this help explain why Americans have such big dwellings compared to much of the world (they need space to get away from others who live in the same residence)? Do “real-life millionaires” buy McMansions? Although it’s a common misconception that millionaires spend their money on luxury vacations, clothing, houses, and cars, what I’ve learned in growing my own net worth — and speaking with other millionaires — is that after a certain point, money stops mattering as much as it once did. This seems to line up with the accepted wisdom that many American millionaires are relatively frugal and made their way to that wealth through saving and hard work. But, if millionaires are not buying all those McMansions, who is? The flip argument expressed above that there are plenty of people living a millionaire lifestyle or above their means does not apply in all cases either. Part of the trick here might be disconnecting income from wealth. Having $1 million plus in wealth does not necessarily mean you have the kind of assets to put down a sizable down payment or make sizable payments on a large house. (Think of the people who have paid off their mortgages and have a lot in retirement and savings accounts – this is not always easy to access.) Some people might be willing to buy homes based on whether they can afford the monthly payments – does it roughly fall within 30-35% of my monthly take-home pay – while others would be unwilling to splurge on a McMansion. To be honest, I have not seen a convincing article or set of data regarding McMansion owners. I would guess a good number are in the top 20% of earners in the United States but probably a good portion are also living paycheck to paycheck. Instead, analysts said, the decline in both marriage and partnerships is likely a result of the declining ability of men to earn a salary large enough to sustain a family. The Pew data underscores the economic marriage gap: Adults who do not live with partners are more than twice as likely to live in poverty than those who have partners. “Our surveys show us that one of the things that’s holding unmarried adults back from getting married is that they feel they’re not financially stable enough,” Parker said. While there are likely additional reasons for this (one example: the development of the idea that marriage is about two economically stable people coming together), marriage in American is increasingly tied to social class. Regionally, economic growth was uneven. African Americans and Hispanics experienced significant gains in income, but still trail far behind whites and Asians. All ethnic groups saw incomes rise between 2015 and 2016, the second such annual increase in a row. The median income of black families jumped 5.7 percent between 2015 and 2016, to $39,490. Hispanic residents also saw a growth incomes, by 4.3 percent, to $47,675. Asians had the highest median household income in 2016, at $81,431. Whites saw a less significant increase than African Americans and Hispanics, of 1.6 percent, but their earning are still far higher, at $61,858. Income inequality isn’t disappearing anytime soon. Despite the improvements in poverty and income across ethnic groups, the American economy is still characterized by significant income inequality; while the poor are finally finding more stable footing following the recession, the rich have been doing well for quite some time now. The average household income of the the top 20 percent of Americans grew $13,749 from a decade ago, while the average household income of the bottom 20 percent of Americans fell $571 over the same time period. The top 20 percent of earners made 51.5 percent of all income in the U.S. last year, while the bottom 20 percent made just 3.5 percent. Around 13 percent of households made more than $150,000 last year; a decade ago, by comparison, 8.5 percent did. While that’s something to cheer, without a solid middle class, it’s not indicative of an economy that is healthy and stable more broadly. Both of these figures – the poverty rate and median household incomes – are important indicators of American social and economic life. Thus, that both are trending in the right direction is good. Yet, we also have the impulse these days to (1) dig deeper into the data and (2) also highlight how these trends may not last, particularly in the era of Trump. The trends noted above (and there are others also discussed in the article) can be viewed as troubling as the gains made by some either were not shared by others or do not erase large gaps between groups. Our understandings of these income and poverty figures can change over time as measurements change and perceptions of what is important changes. For example, the median household income going up could suggest that more Americans have more income or we may now care less about absolute incomes and pay more attention to relative incomes (and particularly the gap between those at the top and bottom). In other words, interpreting data is influenced by a variety of social forces. Numbers do not interpret themselves and our lenses consistently change. Two reasonable people could disagree on whether the latest data is good for America or suggests there are enduring issues that still need to be addressed. The greatest similarities may be their proximity to core urban areas and high-paying corporate or government jobs, as well as their supply of affordable, albeit expensive, homes and good schools. Valerie Wilson of EPI said affluent black families may have had to move farther from cities to find the good housing and schools they seek because the black middle class, with less net worth, cannot afford rising housing prices in the cities or private schools. The emphasis here is on the movement of black households to these counties. 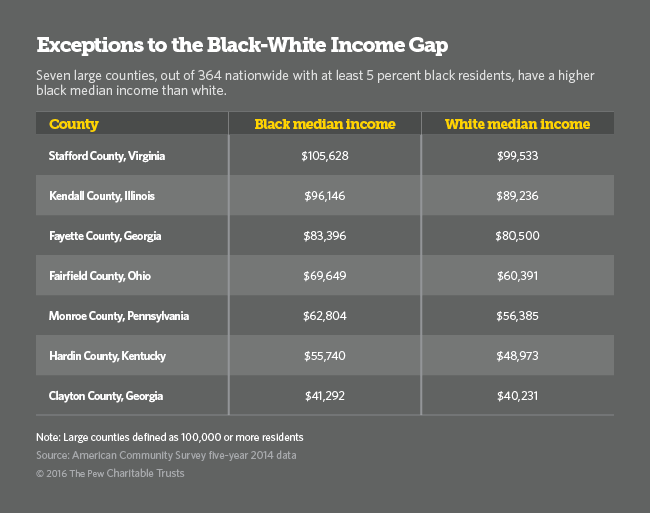 At the same time, what traits do the white residents of these counties have (that they are not living in areas with more inequality)? Did the counties or local governments do anything to help promote these trends? I’m guessing these are largely the result of the “free market.” Yet, just because it happened in seven counties suggests this is a pretty rare outcome of the this free market. What are the levels of residential segregation in these counties? Simply suggesting that blacks and whites have similar incomes doesn’t necessarily mean that the two groups regularly interact. That this kind of equality can only be found in suburban areas likely would not please many suburban critics. However, many large cities and closer suburbs have a range of issues – from concentrated poverty to a lack of affordable housing – that can limit the opportunities for non-whites to succeed. These places would be worth watching in the coming years. The incomes of typical Americans rose in 2015 by 5.2 percent, the first significant boost to middle-class pay since the end of the Great Recession and the fastest increase ever recorded by the federal government, the Census Bureau reported Tuesday. The 5.2 percent increase was the largest, in percentage terms, ever recorded by the bureau since it began tracking median income statistics in the 1960s. Bureau officials said it was not statistically distinguishable from five other previous increases in the data, most recently the 3.7 percent jump from 1997 to 1998. The Current Population Survey Annual Social and Economic Supplement was conducted nationwide and collected information about income and health insurance coverage during the 2015 calendar year. The Current Population Survey, sponsored jointly by the U.S. Census Bureau and U.S. Bureau of Labor Statistics, is conducted every month and is the primary source of labor force statistics for the U.S. population; it is used to calculate the monthly unemployment rate estimates. Supplements are added in most months; the Annual Social and Economic Supplement questionnaire is designed to give annual, national estimates of income, poverty and health insurance numbers and rates. According to the report (page 6), the margin of error for the percent change in income from 2014 to 2015 is 1.6%. Incomes may have risen even more than 5.2%! Or, they may have risen at lower rates. See the methodological document regarding the survey instruments here. The Census has in recent years moved to more frequent reports on key demographic measures. This produces data more frequently. One of the trade-offs, however, is that these estimates are not as accurate as the dicennial census which requires a lot more resources to conduct and is more thorough. A final note: it is good that the margin of error is hinted at in the article on rising middle-class incomes. On the other hand, it is mentioned in paragraph 12 and the headline clearly suggests that this was a record year. Statistically speaking, this may or may not be the case.